Sometimes the very best carving decisions I make are when I choose not to carve a piece of wood. The other day I was visiting my mom and had a few minutes to rummage around in my dad’s old wood pile. He collected all sorts of interesting pieces of wood – from trees he cut down, or slabs from his woodworking friends, or some from friends who saw something they thought he would like. There are oodles of chunks of wood in that pile. Some are pieces so big I could barely move them, and others so small you might be tempted to throw them out or burn them. One piece jumped out at me and called me to run it through my dad’s old jointer. 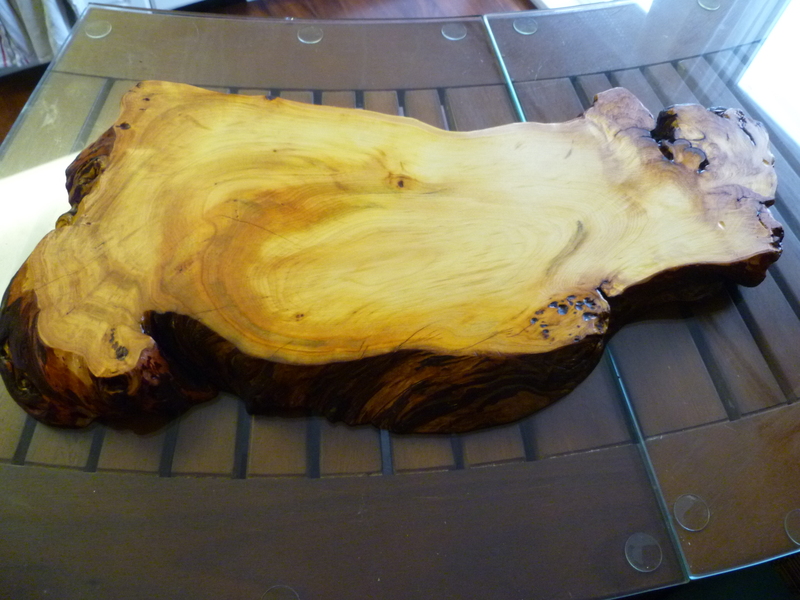 After a few passes, I realized it was a piece of yellow cedar cut as a slab from a burl. Most of these sound like responses from a Rorschach ink blot test and didn’t inspire me much (sorry, friends!). I kept cleaning it up – sanding it first with my belt-sander, then a random orbit sander, and finally a card scraper. The more I cleaned up the wood, the more excited I got. There were really interesting grain lines and little details that showed up better with each scrape of the tools. 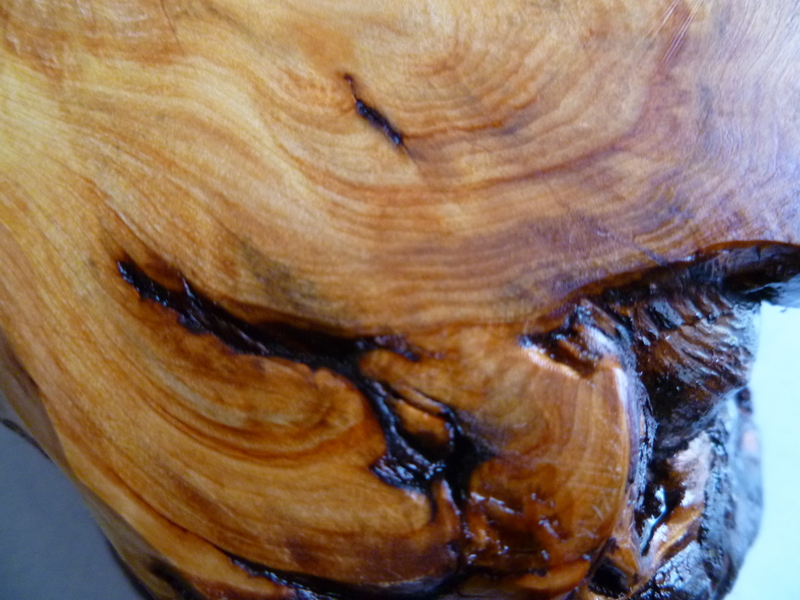 I popped the bark off the edges, got impatient and gave it a swipe with a brush full of oil and beeswax and thoroughly enjoyed what happened to the wood. That’s when my sister-in-law (a great host) suggested using it as a tray for cheese and crackers. 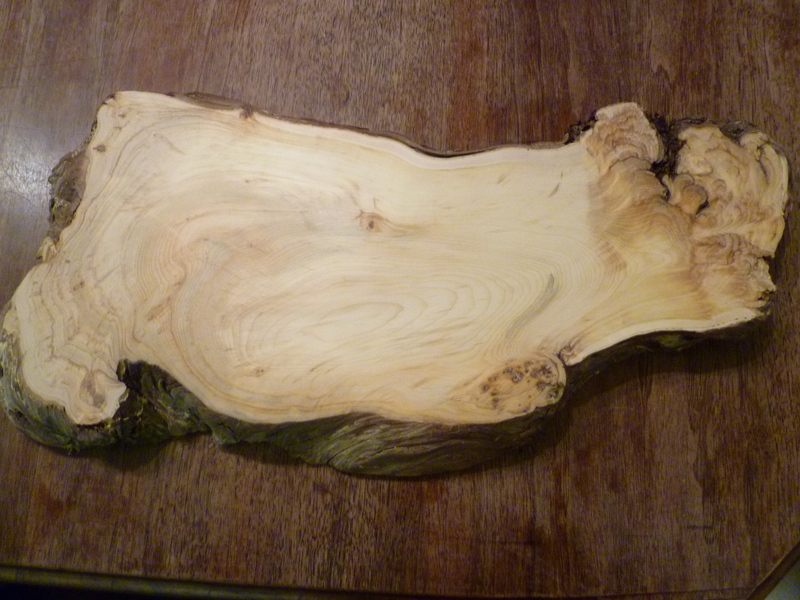 I liked that because I could no longer entertain the idea of cutting into such a beautiful piece of wood. So I proceeded to take the bark off the edges, sand it up a little and scrape the bottom side smooth. 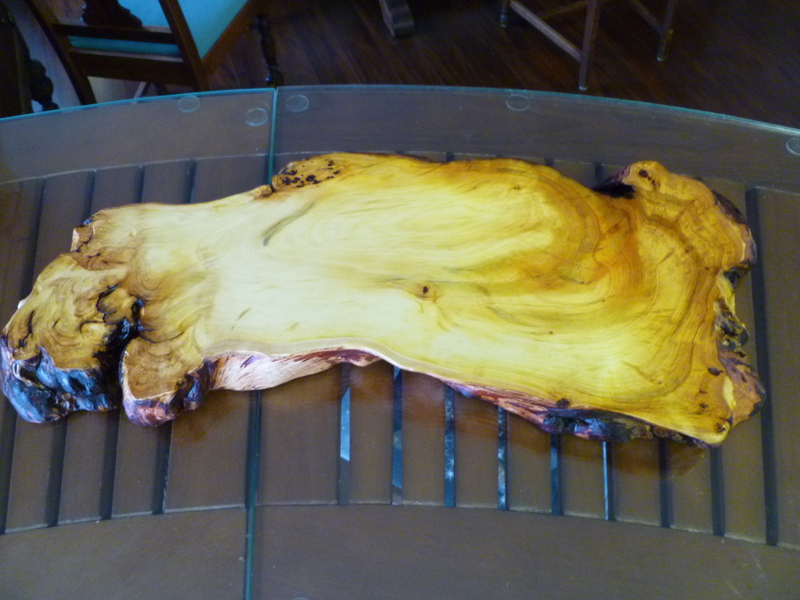 Then I added about 5 coats of oil and beeswax, buffing the slab by hand after each coat. 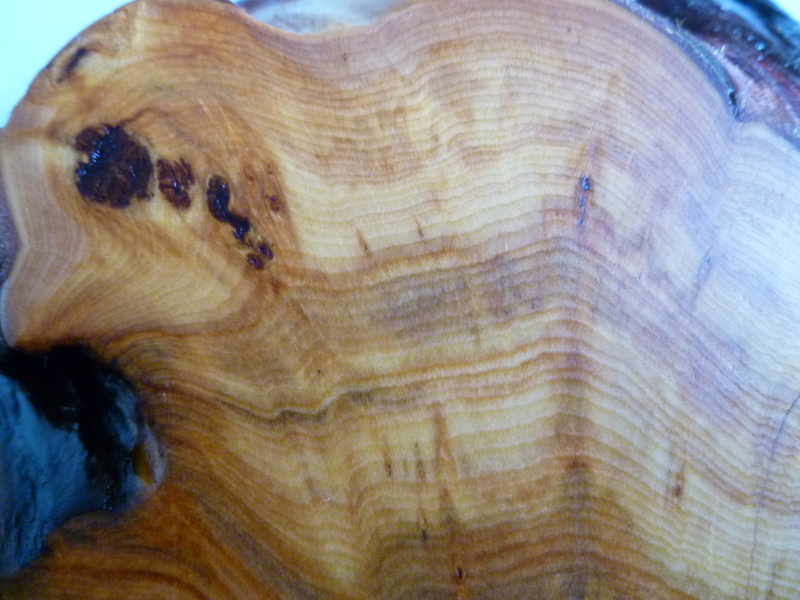 Here are a few close-up macro-images to show you what makes me excited about this piece. Approximate size is 24 inches long by 8 or 10 inches wide (depending on where you measure it) by 2 inches thick. The finish is Lee Valley’s Tried and True Original Wood Finish, which is my favourite finish to use. What do you think? Did I make the right choice, or should I have turned it into a cribbage board or a running dog? Leave a comment! Back in 2003, I picked up a book from the Moose Jaw Public Library on letter carving by Chris Pye. There were all sorts of good instructions and starter projects in it, but naturally I skipped all those and went right to the most difficult of all: letter carving around a circle. It took me hours and hours to figure out how to space and size the letters correctly. 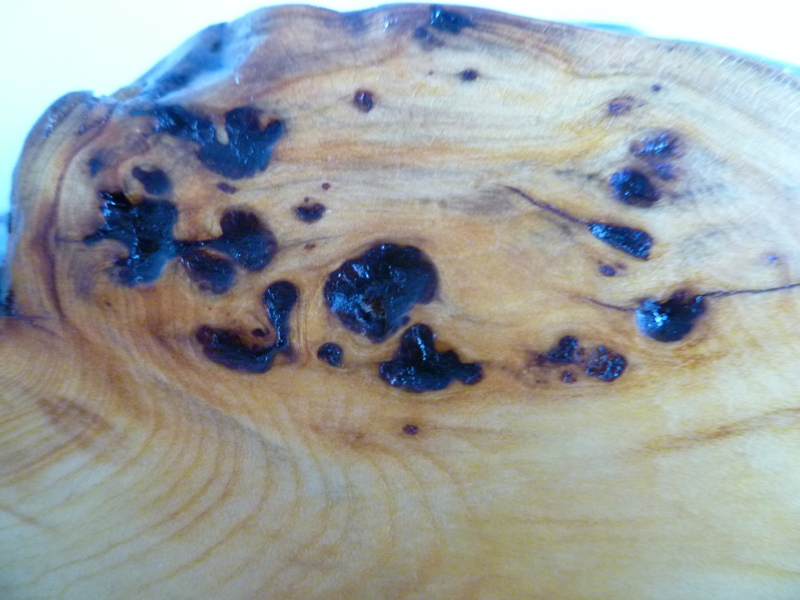 And then, naturally again (if you know me), I chose one of the hardest woods to carve it in – Black Cherry. But while I choose to do difficult projects in challenging woods, I do believe in finding the easiest wood finishes to use and maintain. My all time favourite wood finish is carried by Lee Valley Tools, and it’s called Tried and True Original Wood Finish. 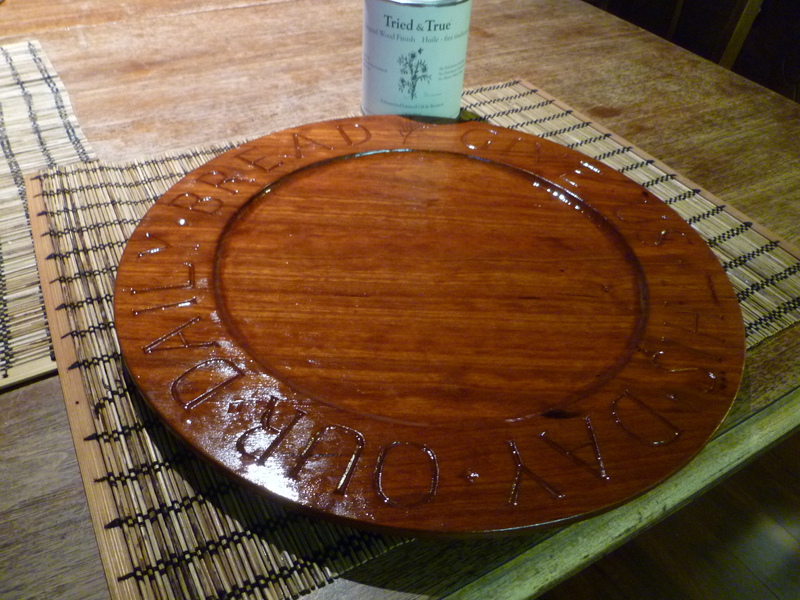 That project I completed in 2003 was a bread plate, and after 9 years, the finish needed a little refreshing. Here it is with a new coat just brushed on and waiting to soak in. I like this finish because it is completely natural – just linseed oil and bees wax – no petroleum distillates, no harmful vapours. It’s food safe, and wipes clean with a damp cloth. It has a soft, antique glow when it’s dry, and buffs up beautifully. What do you think of it? Leave a comment below. 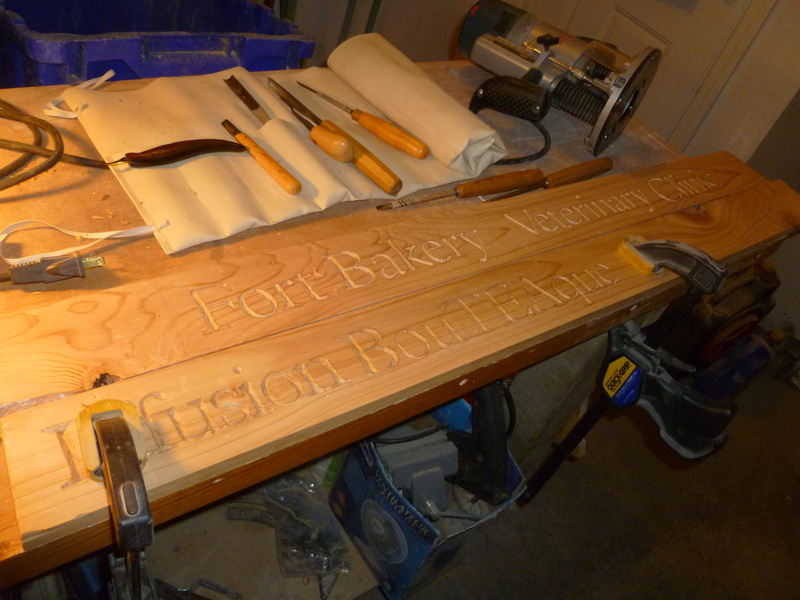 And, in closing, here is a picture of a slightly easier letter carving job I have on the go right now. I’m into high production mode with this job!